Mercadito, the well-known NYC restaurant group, just opened a branch here in Chicago. I had a chance to visit last night and try a couple of cocktails. My expectations were high, given that a number of Chicago's most notable mixologists left other gigs to go and work there. I was a little surprised at just how many people went to work there either full or part time (Jen Contraveos, Dan de Oliveira, Maura McGuigan, Casey Sullivan, Daniel Love, Kyle McHugh), especially since the well-known Tippling Bros. had been brought in to do the cocktail menu. In short, I was impressed. Although all the cocktails and mixed drinks use an agave spirit for the base, they offer a range of options - from the accessible margarita (made the right way, with fresh juices and fruit) to more esoteric offerings with mezcal. Named for Misty Kalkofen from Drink in Boston (or more properly, her tattoo). Misty's a fantastic bartender and advocate for the industry, a founder of LUPEC Boston and a heckuva lot of fun too. Made with Blanco tequila, ginger, hibiscus, fresh valencia orange juice, a touch of serrano chile, and a half rim of hibiscus salt. It was delicious. Spicy, complex, and fresh - very well balanced. Jen Contraveos, at left, made it for me. A salute to three liquor industry folks who have the last name Cooper - Ron Cooper from Del Maguey, Rob Cooper who owns St. Germain, and John Cooper, who owns Domaine de Canton. Rob and John are brothers, from a long family line of liquor industry professionals, but they're not what you'd call close, according to word on the street. Ron is not related to either of them, but is a heckuva fun guy and he imports fantastic mezcals. Made with the Del Maguey Chichicapa mezcal, St. Germain, Domaine de Canton, Averna amaro, egg white and grapefruit. Casey Sullivan, pictured at left, made mine. Apparently this drink is polarizing among the staff, some love it, some think it's a bit too dry and a bit forced - trying too hard to make the three Coopers idea work. I thought it worked really well, and the drink was delicious. It was also well balanced, with the creamy texture from the egg and deep complexity. It was drier than the first, but I like 'em dry so I enjoyed it very much. One other thing I thought was great at Mercadito was the lineup of flavored salts and spices for the glasses. Rather than the stacking trays that could have been there for months with who knows what in them, they have small dishes out for each options that they clean & refill often. "Any drink using a dairy product is fair game: milk, cream, eggs, butter, cheese, yogurt, curds, you name it. Given the importance of dairy products in drinks dating back centuries, there are lots of opportunities for digging through vintage receipts for a taste of the past, and as always innovation is highly encouraged." I've recently written about another drink that calls for cream, the Smashing Pumpkin. In addition, I give you the Jasmine Orchid. I am enamored with jasmine these days, although have set it aside for the last month or so. This drink calls for both jasmine syrup as the sweetener, and jasmine tea to enhance the jasmine further. 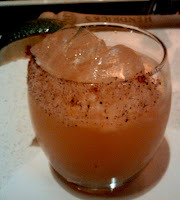 It's definitely a dessert-style drink, and I served it alongside apple pie at a pairing dinner - it was a nice pairing. Of course, since it requires a lot of s haking, I made the guests who wanted refills shake their own! 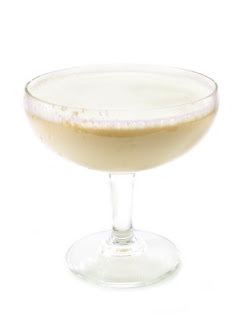 Combine vanilla vodka, syrup, cream, egg white and tea in shaker; shake well without ice. Add ice, and shake vigorously, longer than you think you might need to. Strain into champagne flute or coupe glass; top with soda. If desired, garnish with a few jasmine tea leaves or a jasmine pearl. For vodka: I used our Tahitian Vanilla, which is getting rather hard to find since we suspended production. I imagine others made with real vanilla will work too, such as Tru. For syrup: heat 1 cup of water, steep one tea bag (or equivalent) in water for 45 secs. Remove tea bag, add one cup sugar, and stir well to dissolve. Cool completely, and refrigerate. For tea: steep 1 tea bag in 1 cup water for 45 seconds, then remove tea. Cool completely, then chill. I used Republic of Tea Asian Jasmine White Tea for this drink, so the advice above is for their tea bags. As with any tea, you may need to adjust based on the strength and potency of the tea you use. Thanks to the folks over at eGullet for hosting this month! Note: photo is from istockphoto.com. Last night I teamed up with mixologist Jessi Brickner and Chef Adam Grandt from Sage Grille in Highwood on a Fall Flavor Festival. We led students through six cocktail ideas for fall parties and three appetizers. The cocktails included two for Halloween, two for Football Parties, and two inspired by the season. We had a lot of fun coming up with new recipes, and I wanted to share some of them here. - refreshing and savory, perfect for a cheese course or with a lighter herbed, roasted meat. Shake gin, puree, and sprig of rosemary with ice, strain into champagne flute. Top with sparkling wine, garnish with rosemary sprig. Shake ingredients with ice, strain into cocktail glass. Top with additional dash of cinnamon, and garnish with candy pumpkin or black plastic spider. 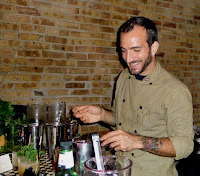 Last night saw another great cocktail competition as part of Boka Restaurant Group's Sweet Sixteen of Mixology. The field was narrowed to eight competitors in the last round, and we're on our way to the final four. Despite the competition, this event is full of laughs and fun, as you can see from the pictures. This match featured Charles Joly of the Drawing Room vs. Maura McGuigan of the soon-to-open Mercadito (and formerly of Graham Elliot). This was a tough match, both drinks were delicious. The sponsor was Bacardi, so Bacardi Silver was used in both cocktails. Charles used fresh canteloupe puree, lemon balm, and spearmint, and garnished with mini melon balls and herbs. Maura added Rittenhouse rye, fresh grapes, ice seasoned with Herbsaint, fresh citrus and a fresh mint sprig garnish. The guest judge this week was R.J. Melman from Hub 51. In the end, Charles emerged victorious, and will advance to the final four in a few weeks. He joins Benjamin Schiller, newly of BOKA (formerly of In Fine Spirits), who won last week's match.